Crescent Shield is another American metal band which is both out of place and time. Their second album 'The Stars Of Never Seen' is another fine disc of classic melodic heavy metal, in the 80's and NWOBM tradition, which is foreign to their own country in this day. Like strangers in their own strange land, Crescent Shield's presence and music is better received in Scandinavia, Europe, and even Japan. It's a shame really for this is first rate stuff. TSONS runs slightly shorter with less songs than their 2006 debut, 'The Last Of My Kind.' Yet, I believe this work to be the stronger of the two. The arrangements are more rich and diverse proving Crescent Shield's ongoing creativity and maturity. '10,000 Midnights Ago' and 'Lifespan' show this in briefer form, but it is the well-composed and masterfully executed 'The Endurance' that truly shows Crescent Shield's versatility, cohesiveness, and imagination. Other notable performances include those songs were classic metal blends with a power metal and some slashing near thrash guitar work as on 'The Grand Horizon' and 'The Bellman.' Overall, there is much to enjoy on this album, and it will take more than one (or two) listens to appreciate the breadth and depth of the musicianship and compositions. Conversely, as with 'Last Of My Kind,' my greatest difficulty again is with Michael Grant's vocals which often sound nasal and strained. Sometimes his range moves so low, slow and foreboding, I think he would be better fit an English doom metal band. However, and as always, I've come to appreciate him as the unique voice of Crescent Shield. 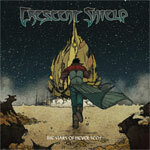 Crescent Shield brings another grand work of classic melodic heavy metal filled with ambitious and diverse arrangements executed with precision and talent. For fans of earlier Iron Maiden, Rainbow, and Dio and present players like Icarus Witch. Highly recommended! Crescent Shield brings another grand work of classic melodic heavy metal filled with ambitious and diverse arrangements executed with precision and talent. For fans of earlier Iron Maiden, Rainbow, and Dio and present players like Icarus Witch.